Easy way to show source, analyze forms, query, cookie and more! PageSpy is an useful tool for web development & web design, that will help you save precious time writing and debugging web pages. It can also help you understand the structure and function of existing pages on the web. If you are a web developer, a web designer or a tester, you need PageSpy! PageSpy is an invaluable tool that will help you save precious time writing and debugging web pages. It can also help you understand the structure and function of existing pages on the web. Once installed, PageSpy is added to the context menu of Internet Explorer. You can then right click any web page and analyze its contents in PageSpy. 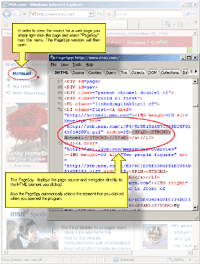 PageSpy will save you time right from your first mouse click: the program displays the page source and navigates directly to the HTML element you clicked. From here, many useful functions are available. PageSpy can show you the DOM based source as well as the original HTML source. It can also analyze any forms within the web page and show you all the information you need, including the form method, action and all input variables. PageSpy can download external files referenced within the web pages. PageSpy is quick and easy to install. Once you have used PageSpy we believe you will wonder how you ever managed without it. However, should you want to remove PageSpy from your machine, it can be completely uninstalled without leaving any residual files. All versions of PageSpy are guaranteed to be 100% free of viruses and spyware. It is quick and doesn·t hang your browser. The demo version is free and can be downloaded here. All in all Pagespy is an excellent tool and it saves me time every single day. I recommend it to all my fellow web developers. It's a great program and I have found it very usefull as I am currently linking to a lot of external .js files and your program allows me to follow the code that those .js files generate.